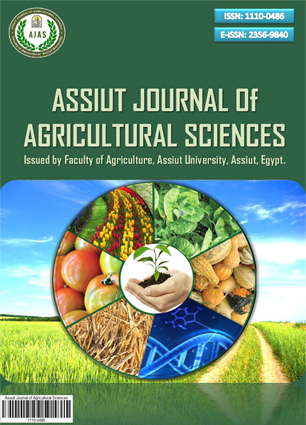 1Department of Agronomy, Faculty of Agriculture and Natural Resources, Aswan, Uni-versity, Aswan 81528, Egypt. 2Water Studies Research Complex (WSRC), Toshka- Abu Simbel City, National Water Research Center, Egypt. Tow field experiments were carried out at the Experimental Farm of the Water Studies and Research Complex (WSRC) Station, National Water Research Center, in Abu Simbel, Toshka Region, Egypt during two winter seasons 2015-16 and 2016-17. The main objectives were to study the effect of different irrigation levels [A1=100% of crop water requirements (ETcrop), A2=80% ETC and A3=60% ETC], three rates of nano-fertilizer (lithovit) (B1=0, B2= 200 and B3=400ppm), three levels of nitrogen fertilizer (C1=60, C2=80 and C3=100 kg N fed-1) and their interactions on yield and its component, water use efficiency (WUE), fertilizer use efficiency (FUE) and quality of durum wheat plants. The experimental design was a strip-split plot with three replications. The tested agronomic traits were: plant height, No. of tillers m-2, spike length, No. of grains spike-1, 1000-grain weight, grain yield, water use efficiency (WUE), irrigation use efficiency (IWUE), fertilizer use efficiency (FUE) as well as protein and ash content, hectoliter weight and Hegberg falling number. The results indicated that the irrigation levels, nano-fertilizer concentrations and N-levels had significant effects on most yield component, water parameters, fertilizer use efficiency and quality of wheat plants in both seasons. Increasing irrigation levels from 60% to 100% increased all agronomic traits and FUE, but WUE, IWUE and falling number were decreased. The treatment of 400 ppm nano-fertilizer produced high values of all yield parameters, water relation, FUE except falling number. Increasing N-levels from 60 to 100 kg N fed-1 increased all studied traits, but FUE and falling number were deceased. The maximum grain yield (2192.4 and 2251.6), (2026.8 and 2075.7) and (1904.3 and 1964.3 kg fed-1) were produced when 100% of irrigation water, 400ppm of lithovit and 100 kg N fed-1 were applied in the two seasons, respectively. Based on the obtained results, it could be concluded that highest irrigation level of 100%, nano-fertilizer concentration of 400 ppm in combination with N-level of 100 kg fed-1 is suitable for Toshka climatic conditions to increase the grain yield and quality of wheat (Triticum durum L.). 1قسم المحاصیل ـ کلیة الزراعة والموارد الطبیعیة ـ جامعة أسوان ـ أسوان ـ مصر. مستویات الماء، ترکیزات النانو ومستویات السماد النیتروجینى أثرت معنویاً على جمیع الصفات بالدراسة وهى إرتفاع النبات ، طول السنبلة ، عدد الفروع بالمتر المربع ، عدد السنیبلات بالسنبلة، وزن 1000 حبة ، ومحصول الحبوب والقش وقراءات الماء وکفاءة إستخدام النیتروجین بالموسمین وأیضاً النسبة المئویة للبروتین والرماد ورقم السقوط ووزن الهیکتولیتر لمتوسط الموسمین. زیادة مستویات الماء من 60% إلى 100% من إحتیاجات الرى زادت جمیع الصفات المحصولیة وکفاءة إستخدام النیتروجین ولکن علاقات الماء ورقم السقوط بالثوانى نقصت بزیادة مستوى الماء. عند أعلى مستوى ماء رى سجلت أعلى القیم لمحصول الحبوب وکانت (2192٫4 و 2251٫6 کجم لکل فدان) بالموسم الأول والثانى على التوالى. سجلت أعلى ترکیزات سماد النانو اللیثوفیت أعلى القیم بجمیع الصفات محل الدراسة ، وکانت أعلى القیم لمحصول الحبوب (2026٫8 و 2075٫7 کجم لکل فدان) خلال موسمى الدراسة على التوالى. إستخدام 100 کجم نتروجین للفدان أعطى زیادة لجمیع الصفات ماعدا کفاءة إستخدام النیتروجین ورقم السقوط بالثوانى نقصت عند ذلک المستوى ، وسجل محصول الحبوب (1904٫3 و 1964٫3 کجم للفدان) خلال الموسمین على التوالى. فى النهایة وإستناداً إلى النتائج المتحصل علیها تبین أن إستخدام مستوى مائى 100% (2700 م3/فدان) من إحتیاجات الرى وسماد النانو اللیثوفیت بترکیز 400ppm وتطبیق 100 کجم نیتروجین للفدان کان مناسب لظروف منطقة توشکى کما سبب زیادة فى محصول الحبوب للقمح الدیورم ( صنف بنى سویف 1).